Thanks to everyone for their advice regarding my table saw choice. Now that I have it set up, I thought I’d share my observations and experience with it, hopefully this will help someone in their choice. Setup was reasonably easy. One of the cast iron wings is slightly bowed in the middle and you can feel that it is higher than the table. It measured ~0.010 which is acceptable for table flatness from what I have read. The wings did not need shimming and are parallel with the main table across their length at the front and back. The bevel on the wings is about 1/16” smaller than the table, this isn’t an issue, but it would have been nice if they matched. When I originally measured the blade to miter slot parallelism it was around 0.007”. After using the saw for a short time I checked it again and found that it had increased to 0.020”. I discovered that the 4 bolts holding the table down were not loose, but definitely were not tightened down properly. I was able to get the parallelism down to 0.002” and tightened the table down. I found that the blade shifts to the side by 0.007” when changing the direction of travel. Not sure if this is common or considered an issue, it does however stay in position throughout the whole range of travel. I took the measurement on the blade above the arbor, I should also check the front and rear of the blade to see what is going on. I’m not a big fan of how the riving knife is adjusted. It’s difficult to get parallel to the blade and very finicky. Not sure how this is done on other table saws but I think this could be improved. I ordered a Vega Pro 50 fence in anticipation of the issues I heard some people had with the standard fence and because I wanted extra rip capacity. Out of curiosity, I briefly set up the stock fence to see for myself. The front fence rail is a two piece unit, the ends were not cut well and needed filing to sit flush and parallel to each other. When moving the fence into the same position from the left and right it did locked down a couple of degrees either side of square. I didn’t see any way to adjust for this so I moved on to setting up the Vega. If anyone wants to buy the stock fence PM me (located in Orange County, CA). Getting the Vega set up parallel to the miter slot is tedious. The head is attached to the fence via 4 bolts which have to be loosened, the fence then tapped into place, and then the bolts tightened while hoping that it doesn’t shift. I like the grub screws for adjustment I have seen in the head of Biesemeyer style fences. The front rail bolted up to the existing holes in the G0771 which was nice, however the measuring tape was slightly off at the limits of adjustability. This was easily fixed by removing the sticker with the red line on the measuring sight and marking it off center. I scored a line on both the top and bottom of the sight, then ran a sharpie over it to make the score lines visible. This reduced the parallax effect and makes it easier to position the fence accurately. The rear rail did not align with one of the holes in the table and required drilling a hole in the rail which wasn’t a big deal. The micro adjust feature of the Vega is nice, I find it useful when matching dimensions on non-consecutive cuts. One little criticism that doesn’t affect functionality is the cover for the top of the fence is about 3/32 too short and slides back and forth in its slot. So far I have to say that the Vega Pro 50 is a great product to use. It locks down repeatedly in the same position and is sturdy. Just for clarification (as I saw some comments that state otherwise), the rear rail is not used to lock the fence down. It is only used to stop the rear of the fence from lifting as well as providing a surface for the rubber stop on the underside of the fence to glide along. The stock miter gauge has quite a bit of play when indexed to any position. I’m guessing min +/-1 degree. When locked down using the handle the is no play but it would need to be accurately set first. I was a little surprised that Grizzly does not offer a zero clearance insert for this saw. I was going to make one, but I stumbled upon one at Woodcraft from Leecraft. The RG-5 insert is made for the Ridgid R4512 and costs ~$26. They also make the RG-6 without a riving knife slot. Both handwheels had overspray in a few areas which doesn’t really fit to the general good quality of this saw. Overall, I’m happy with my purchase and would likely get another Grizzly if I felt the need to upgrade. Power has been sufficient so far, however I haven’t cut anything other than ¾ materials (ply, MDF and pine). With the upgraded fence I’m getting accurate and repeatable good quality (to me) cuts. I’m using a Forest Ply Veneer Worker 70T ATB Thin Kerfe. Thanks for the review. I have always had good luck with Grizzly tools. I have the G-0715 and found that most of the complaints about the fence were caused by improper assembly. And, after a sanity check with the techs at Grizzly, I too had miss read the instructions. Good review, and listing of the run-outs. I wonder what the factory tolerance is compared to your findings? Table flatness 0.016” ...(I have a 36” straight edge of great quality, that’s about the same.) This is a tablesaw for cutting wood, not a Milling machine ;) I would find this a very acceptable flatness. As for you ZCI, I wonder if the insert for the G0715 is not the same?? But I’ll bet that you checked that out already. Ah, interesting. What were the assembly issues most people had with the 715 fence? When I first saw the bow in the wing I was a little annoyed, it felt quite large when I ran my finger over the ‘lip’ it created. I was quite surprised when I measured it to be only 0.010”, I probably measured it 3 or 4 times as it felt like at least 1/32”. The shop cabinets I just built went together nicely so I’m happy with the saw. Unfortunately the G0715 ZCI is different. I spoke to Grizzly hoping that they had one somewhere on their site that I wasn’t finding but they don’t make one for the G0771. Makes me wonder if the G0771 shares any of its parts with the R4512 if they use the same ZCI. Did your G0715 come with a mitre gauge? If so, does it have the issues I described above? When putting the 0715 together, both wings had a bit of a warp or bow to them, that’s pretty normal in a casting I think, but as I put them on the saw table, I snugged them up then gave a light tap with a dead blow and they set right in. Then I tightened the bolts. Grizzly and the tech knew what the problem was right away … (He did say that I’m not the only one who miss-read and miss-understood the instructions). The rep at Grizzly that I spoke with told me that Grizzly comes up with a saw design and a set of specs, sends them out to the manufacturers to get bids … So, I would suspect that this manufacturer just might be making saws with several brand names … if the guy with the 0771 contract also makes the 4512, they just might be the same top … ? The G0715 indeed does come with a miter gauge, and it fits well in the slot, not perfect, but as well as any OEM miter gauge. So if I want real accuracy I use the sled. I started with a Grizzly G1022 contractor style saw and used it for years till a divorce forced me to liquidate everything. Then I found a used Rigid 4500 … and used it for years till I decided that I would treat myself to a cabinet style saw, and after much research, I decided that the Griz 0175 was the one for me. And I couldn’t be happier. Check the side of the bar that runs through the miter slot. There may be some Allen key holes that will allow you to reduce the slop. My stock miter gauge came with these. Yes, my miter gauge came with them. It’s a perfect fit when adjusted for me. The play I meant was before the head is tightened down and is resting in an indexed position. The head can rotate a degree or two in either direction. I was looking at a cheesy old miter gauge that I should have thrown away years ago (but it’s a tool ya know) ... and it had the same kind of “head slop” that you describe. The one I have was not seating all the way down tightly, so an added washer solved that. now I have a working cheesy miter gauge that I most likely will never use … Like I said earlier in this thread, I use a sled that I made with the 5 cut method that is with in 1-10,000th of being dead on square (0.0001). But I do use the OEM miter gauge for general woodworking … I check it often for 90°. I actually just finished putting mine together right before I had to go to work. So I haven’t had a chance to use it yet. But the only problem I have with it the ruler on the tray for the fence is 5/16 off on the right side and 1/8 off on the left. Is this my assembly mistake? I wasn’t planning on using it for anything other than a reference any way. But I have to know did I mess it up or was it grizzly’s fault? I’m guessing probably mine. I have this same saw but after much frustration decided to upgrade the fence to a Shop Fox Classic fence. Now that I’ve upgraded the fence I love it but I wouldn’t repurchase the saw if I had a do over. I would’ve purchased a saw with a better more accurate and reliable fence from the beginning. 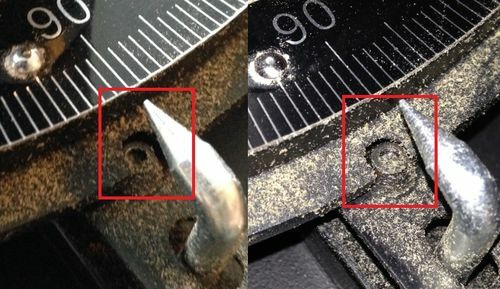 About the GO771 and the Vega pro 50, did you have to drill new holes? I’ve been using the stock fence on this saw for a year and am ready for an upgrade. Thank you!